Above is a photo of the "First Covenant Church." It is located off of Highway 50 in Rancho Cordova, CA. Ted Smith is probably one of the best preachers in all of Northern California. Although, that is up to debate. He is probably the most humourous preacher in all of Northern California. 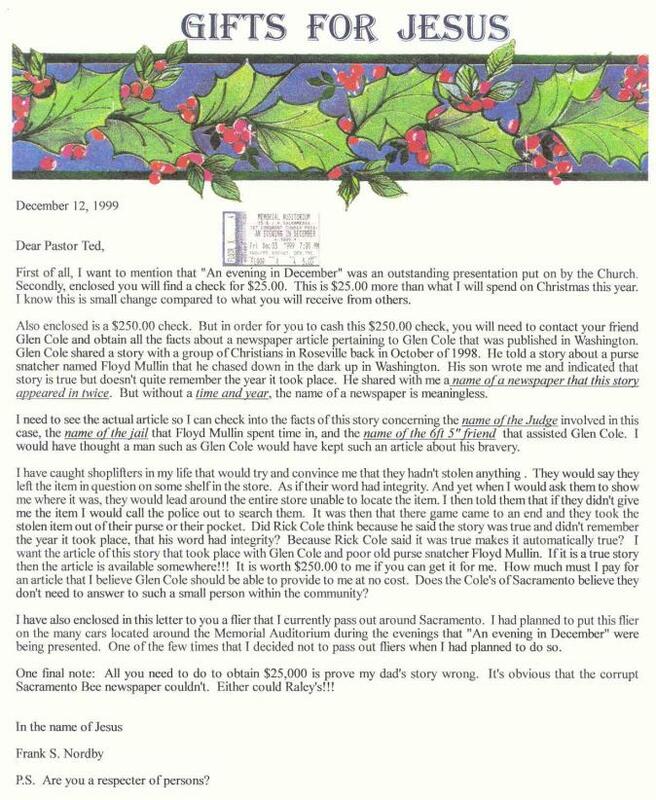 It appears through some of Smith's messages, he is a good friend to politician Tim Leslie. Leslie sometimes finds his name being conveniently placed into some of Smith's Sunday morning messages. Maybe Smith mentions his buddy's (Leslie) name because Ted Smith wants everybody to understand he is in the "know" with the politicians. And there certainly isn't anything wrong with that. And there probably isn't anything wrong with him giving money to Tim Leslie's political campaigns. Smith mentioning Leslie's name during his Sunday morning message that coincides with Leslie's ambitions for being elected into a political position might also just be a coincidence, and there certainly isn't anything wrong with that. Who cares? Maybe Smith believes Leslie is an outstanding public servant and would like the masses, to whom he preaches to on Sunday morning, to feel about Leslie the same way he feels about Leslie? 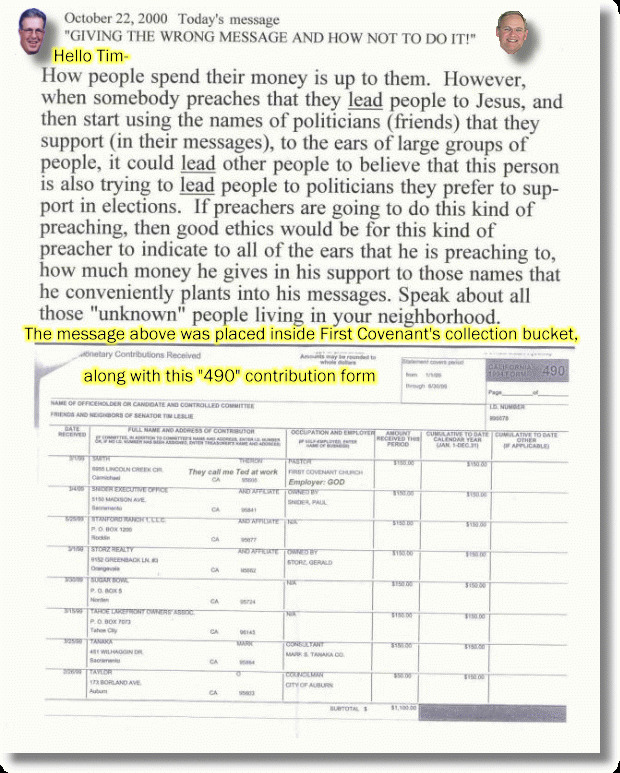 So, when his listeners go back home or to work on Monday morning, they might share with their neighbors, or fellow employees, how their Pastor Ted Smith and politician Tim Leslie are "just like that." And what is wrong with that? I mean, let's face it, check out First Covenant's web site. How much money is this church spending to put up this web site? What individuals are they trying to reach? Surely not those who can't afford a computer or dial up internet access. I am certainly not trying to reach those individuals with this web site. I am trying to reach the same individuals they are trying to reach. The ones with money. 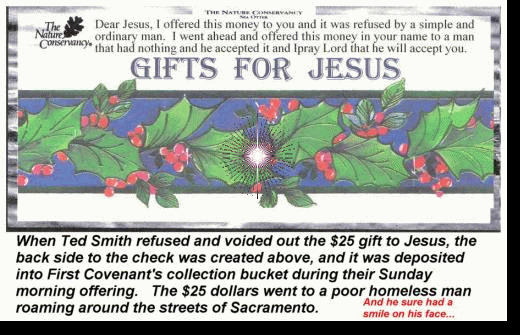 I don't want their money, but it is very possible that First Covenant Church does. And personally speaking, I like the christian music my sites provides more than what First Covenant provides when people come onto its site. This church truly wants to welcome all of those within the community. In fact, when you become a member to this church, this entitles you to join in on all sorts of get-togethers and family functions. Sometimes, you can even attend dinner engagements at this church. You pay a certain fee for you and your spouse (if you have a spouse) to attend this function. The dinner might consist of enough food to provide enough energy for you and your spouse to get home and enjoy a real meal. But the good news is that if First Covenant Church in Rancho Cordova has any left-over food from a dinner banquet they provide to church members, they will offer to sell the left-overs to those who have already paid a reasonable price to come to this banquet in the first place. Maybe this particular First Covenant Church practice is found somewhere in the Bible Scriptures. Is there a section in the Bible that instructs churches on how to increase church revenues? When Jesus fed the multitudes with the seven loaves and fishes, were the left-overs sold for money to the same people? During the month of December, First Covenant Church entertains the community at the Memorial Auditorium in downtown Sacramento. The entertainment is called "An Evening in December," and it has become an annual event. After this musical play is completed, Pastor Ted Smith will introduce himself, throw out a little humor and then inform the audience there are informational cards available for them to fill out and drop off before they leave. He also states humorously "not to worry, we don't want your money." First Covenant Church doesn't want anybody's money at the Memorial Auditorium. However, if you fill out one of those informational cards while attending "An Evening in December," and you make any indication of not belonging to a church and make a request for them to contact you, they will contact you. And, if you somehow find yourself going to this church in the future, it will be then they start requesting your money. 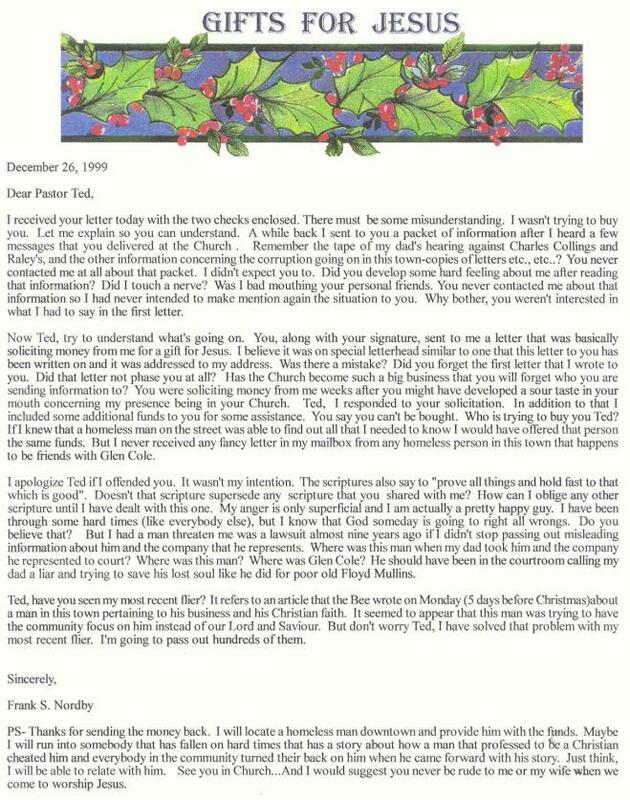 Above is a sample letter Pastor Ted Smith might send to you which might by the first indication this church wants you to direct some of your money to them. I am sure letters like this are very effective in producing great revenues. 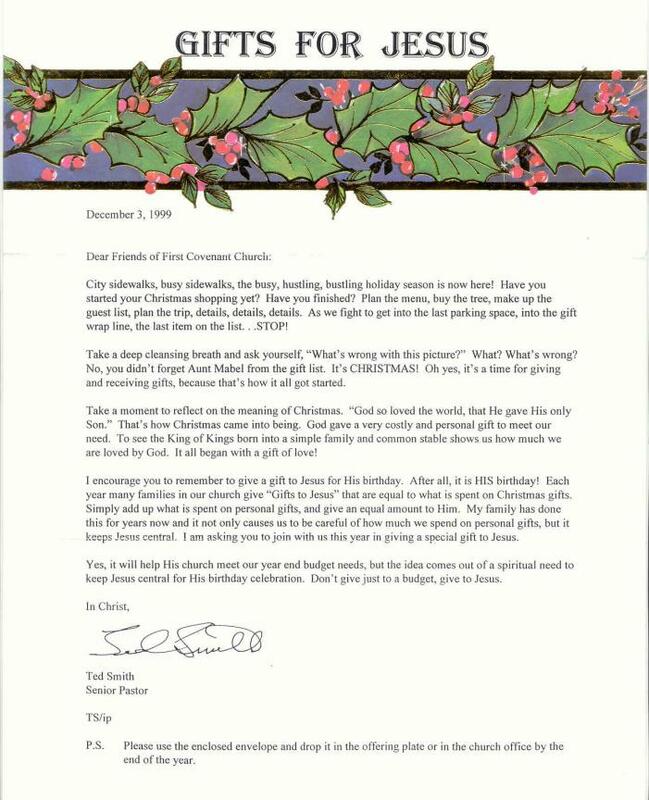 In fact, below is a letter I sent to Pastor Ted Smith concerning his "Gift For Jesus" letter.